OERCA is a powerful web-based animal welfare and communications system designed to meet the specialized needs of zoological and wildlife management. 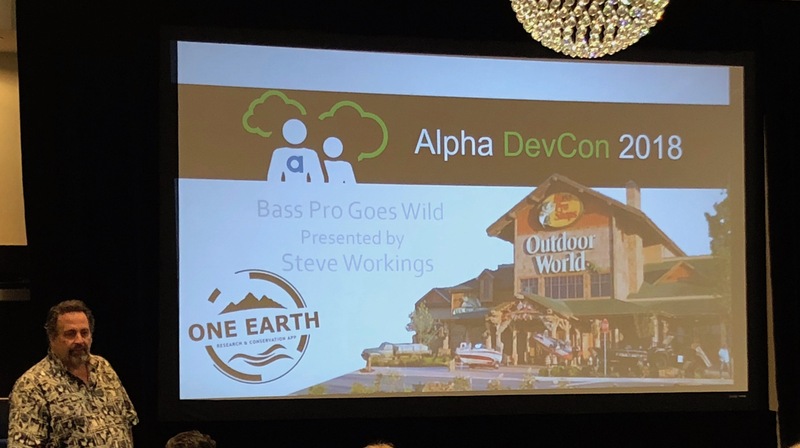 Citing a case study from its customer, Bass Pro Shops, which has aquariums in their stories across the country, Workings and Feucht discussed how its software manages animal welfare, water quality and required communications with veterinarians through its desktop, web and mobile app environment. The system, powered with Alpha Software technology and sensors, includes a sophisticated water quality management tool. Throughout the day the system tracks and records water quality metrics, and issues alerts if a water quality metric falls outside its accepted parameters. OERCA's system provides analytics dashboards - integrated with Microsoft PowerBI - that report on these metrics. The system automatically records critical aquarium and water data for its clients -- saving workers 60% of time previously spent doing manual data entry. Oerca was proud to share that the app had over 97..73% engagement with users. 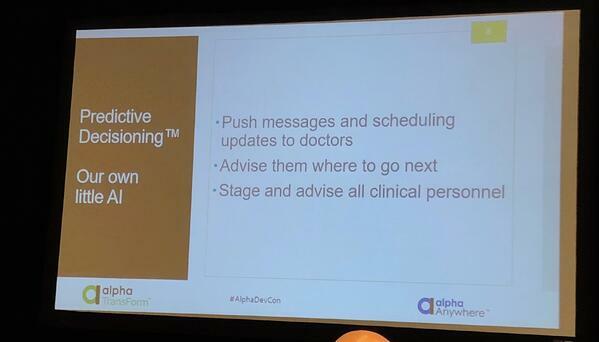 In his presentation, Workings referred to the growing importance of building apps that better present data insights, and cited the morning keynote on data storytelling by RJ Andrews and a recent Alpha Software blog on PowerBI as particularly relevant content for attendees to explore. Building Engineering is a provider of energy efficiency inspection, testing, and rating services for residential and commercial buildings. The Company is utilizing the full Alpha Software platform to build a new recurring revenue SaaS business that transforms the energy rating industry. Darol compares the HERS energy index to the MPG rating for cars -- how efficient a building or home is. 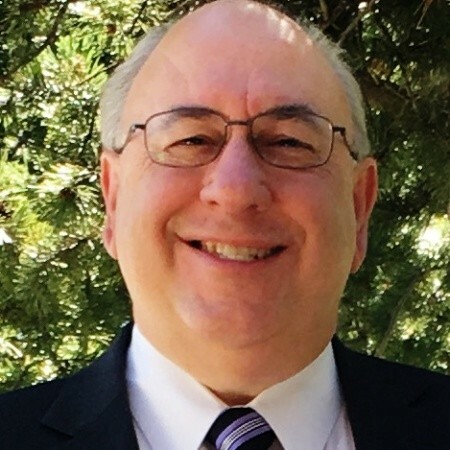 Harrison discussed the difficulty inspectors face capturing extensive inspection data on paper forms, sometimes working in attics during summer upwards of 130 degrees. 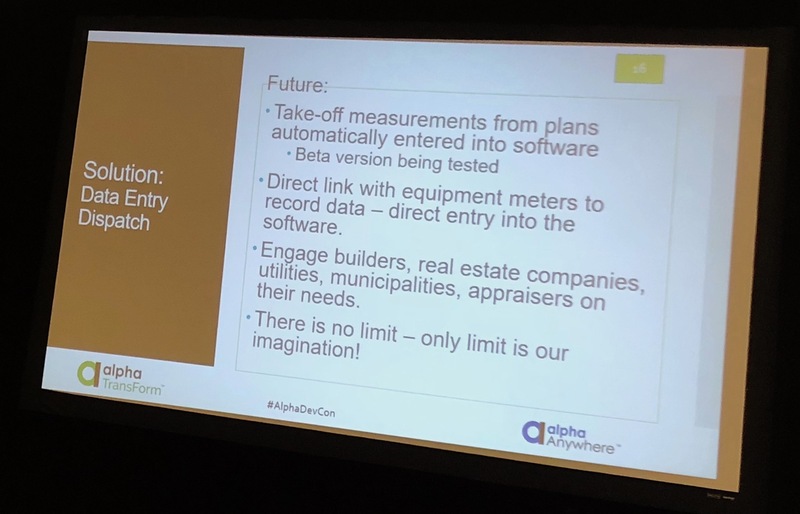 In turn, transferring paper form data for 10 house ratings could take 5-10 hours, for a company inspecting 50 houses it could take up to 100 hours.Unfortunately, no mobile app existed to reflect the current technology available to energy rating workers, so Harrison turned to Alpha TransForm to mobilize the data capture process. 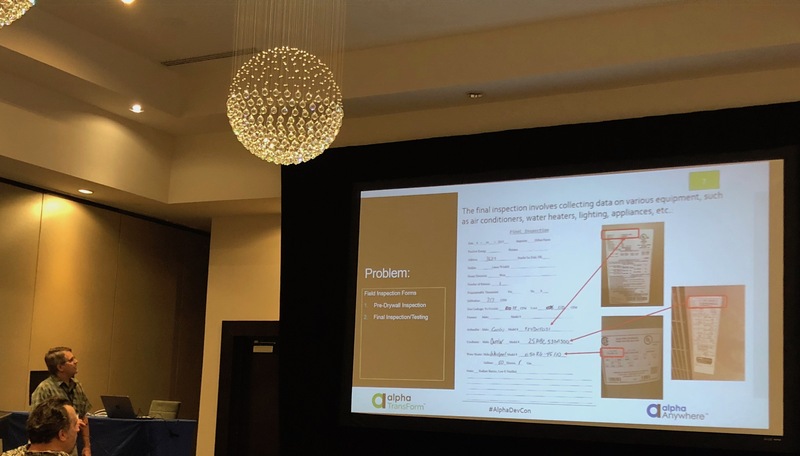 Harrison showed the original paper form his inspectors used and illustrated the dramatic time savings delivered by auto-populating forms, speeding data collection in the field on a mobile device, and adding images, mapping and more to the inspection process. Not only has Alpha TransForm allowed inspectors to increase their throughput of inspections, but the data is more accurate and available to systems immediately. Harrison showed some future plans to further evolve the app, including directly linking to equipment meters to record data. 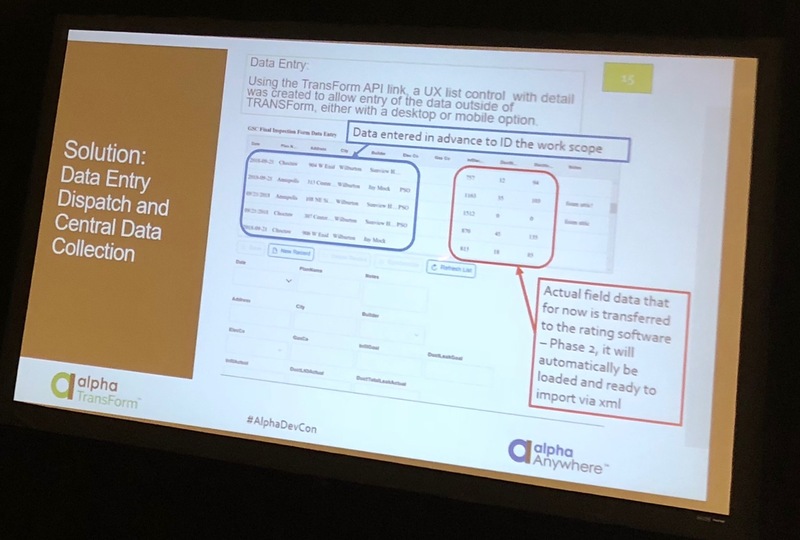 He explained that a mobile data collection solution is actually the easy part, but taking the data and integrating it into third party or existing software for reporting is the true challenge - that's where Alpha Software and its developers come in. According to Harrison, with Alpha TransForm "There is no limit - the only limit is our imagination!" 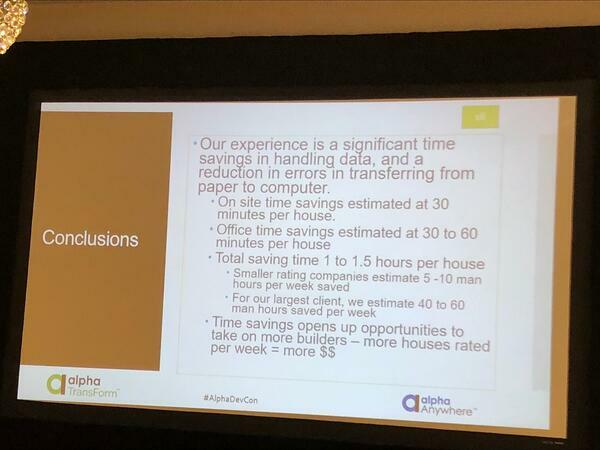 At the end of his presentation, Harrison shared compelling ROI and time savings data, including on-site savings of 30 minutes per house, office time savings of 30-60 minutes per house -- totally saving 1-1.5 hours per house. For it's largest client Harrison expect to save 40-60 man hours per week. Patient Innovations delivers on-time health care, saving hospitals critical time and costs, while improving patient experiences. 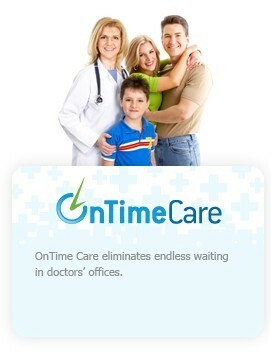 Ken Greenberg is working with hospitals and clinics, including United Healthcare and Henry Schein, to eliminate waiting in doctors offices -- waiting for doctors, waiting for equipment, etc. 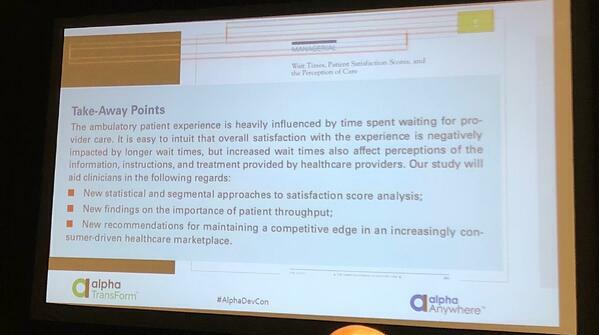 He cited data that talks about wait times killing the patient experience and the perception of the information, instructions and treatment provided by healthcare professionals. Patient Innovations is using bluetooth and APIs to track equipment and staff at 80% less cost than RFID tags. What makes the solution so successful is that it doesn't require any human input to run the system. 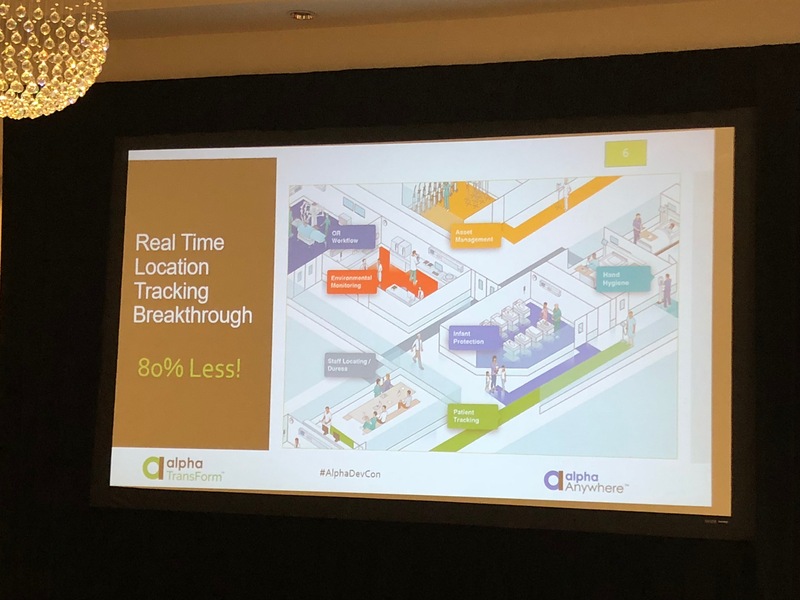 Alpha Software works to track all bluetooth tags and other sensors. Peter Conway discussed the importance of data, "If you aren't measuring, you're guessing!" 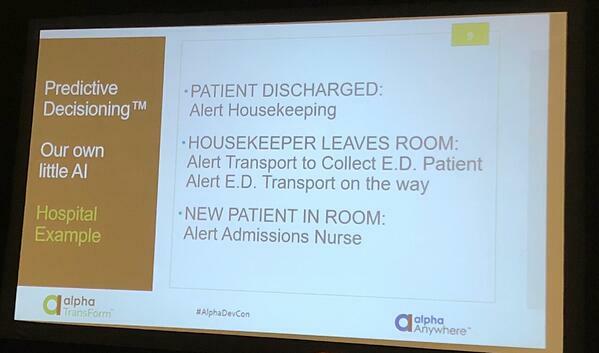 Alpha DevCon 3018 continues through Friday, with more customer case studies and technical sessions planned. For more Alpha Software customer stories, visit our Case Study Library.